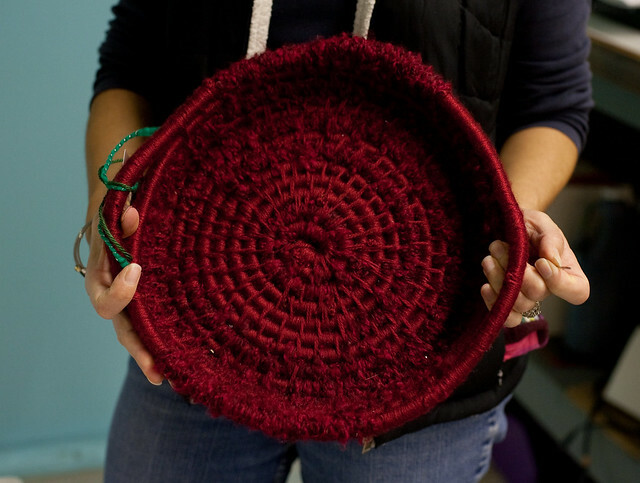 Susan used red wool yarn to make her gorgeous basket. She was kind enough to give me a private tutorial. I chose a length of rope to use. She said you can attach individual lengths of rope together if you want to make a bigger basket. I decided to work with a smaller piece. She got the project started by making a tight coil and securing it the best she could with an embroidery needle and some yarn. It’s okay to have a small hole in the very center of the basket. 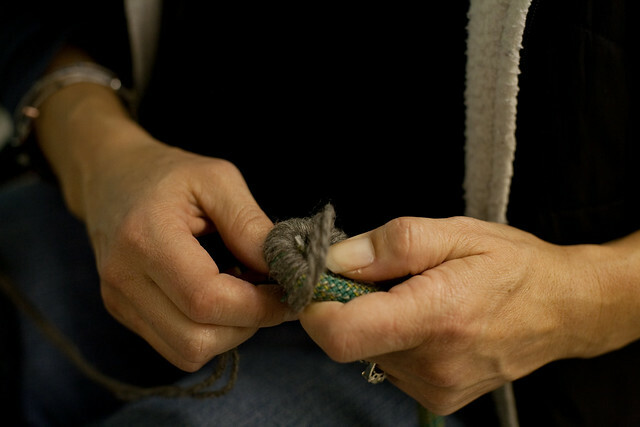 She showed me how to simply wrap the rope around and around with lengths of yarn, doubled to make it extra thick. You start with a piece of yarn about 2 feet long. 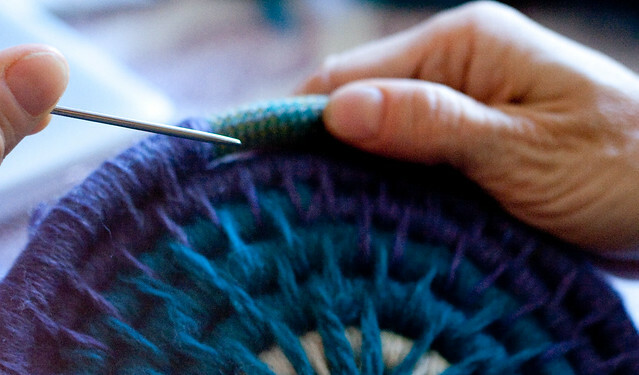 When you finish with each strand of yarn, you sew in the end under some of the other threads to secure it. At the end of the project, you’ll trim the ends and tuck them in. 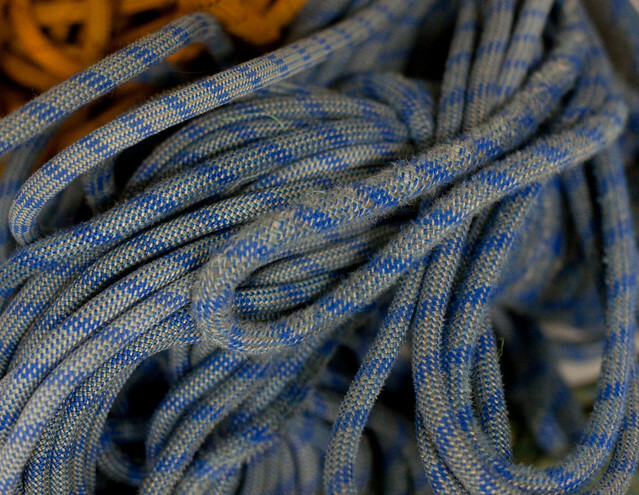 Every four or five times around, the yarn goes around the second row of rope to secure the coil together. That’s basically it! 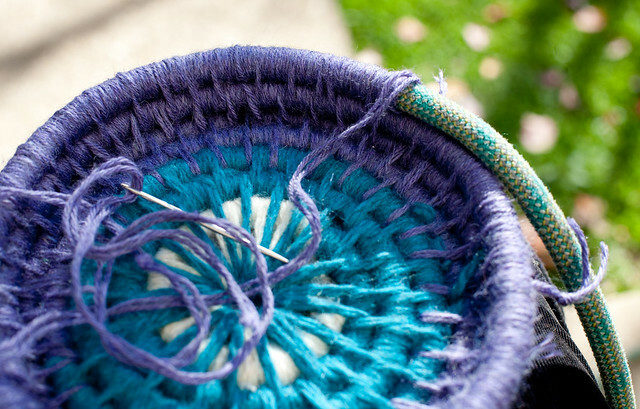 The basket that Kelley, Susan’s partner at UpCycle, is making shows the process well. You can see that the longer “stripes” represent the places where you wrap around two layers to connect the rope together as it coils around. Susan sent me on my way with a few yards of climbing rope and a good start on my basket project. Here you can see the start and how I coiled the unwrapped climbing rope around so I could decide on how I wanted the final basket to look. You should make a pretty wide base so the basket doesn’t tip over if you decide to make the sides higher. I decided to make a shallow basket like Susan’s red version. When I got home, I found some purple and blue yarn to use with the remaining white for the rest of the basket and continued on, wrapping the yarn around the rope four or five times, poking the needle through the row just underneath, and then coming up the other side to secure the rows together. 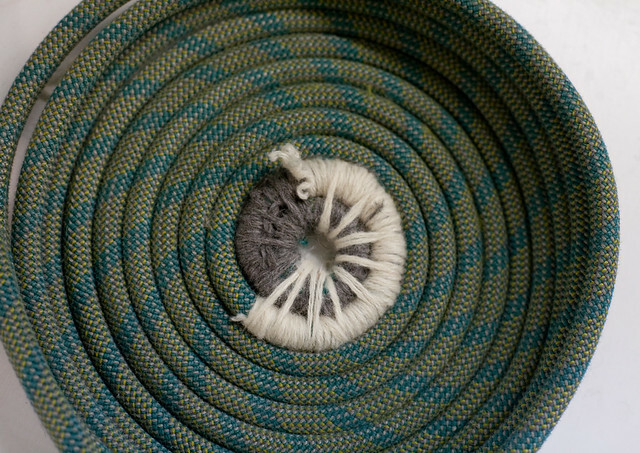 After about six rows, I arranged the remaining rope around the sides to see how the bowl might shape up and to figure out when I should start angling the edges upward. Eventually, I did just that. I allowed the rope to rest slightly outward from the row below so I could form the sides at an angle for the remaining rows. Finally, I got to a point where I could use the remaining rope to make handles. After I cut and wove in a lot of little ends of yarn, I was finished. It feels really solid to the touch. 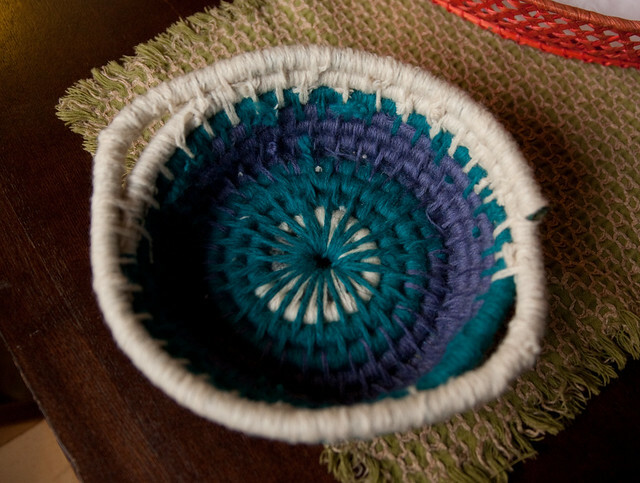 And, now that I know how to make the basket, for the next one, I can choose my yarn colors and design more deliberately. I’m quite proud of my beginning basketry work using ropes. It’s a different process than basket weaving, which Katie and I endeavored to do with old maps. But, just as gratifying, and a great way to use the copious stash yarn we knitters often accumulate. 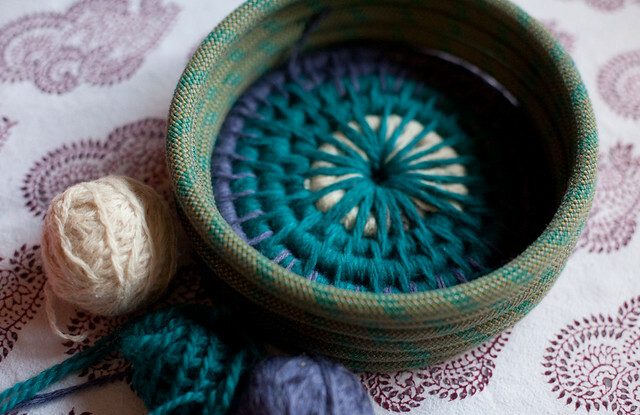 The idea of making small baskets is great too, since they work up quickly and make nice handmade gifts. 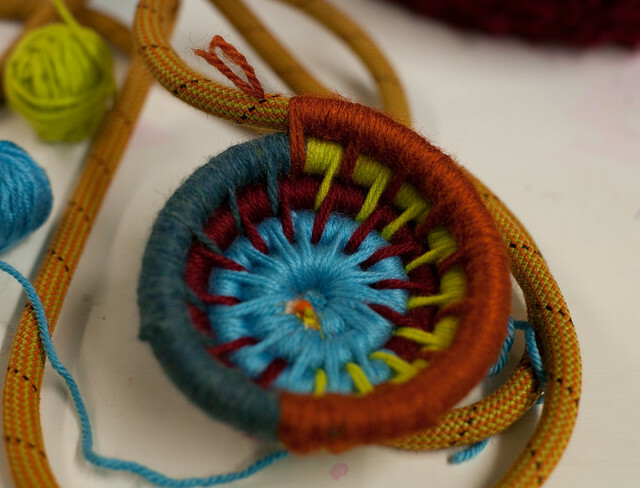 If you want to try making a rope basket yourself, you can get some climbing rope from UpCycle CRC. And if you have rope to donate, they would be happy to take it from you. 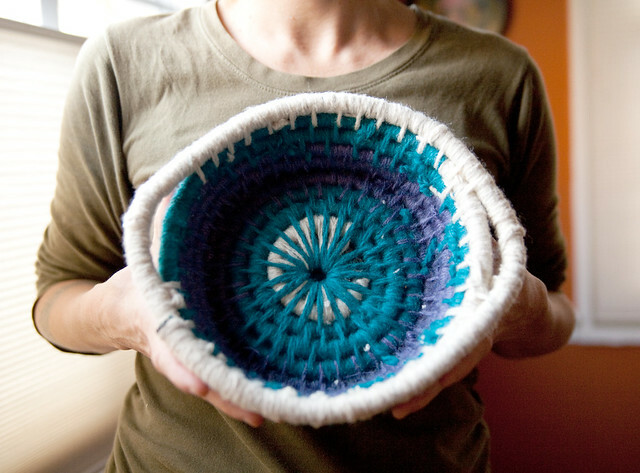 I love this basket and I am going to see if I can get some rope to make a basket too! Thanks for sharing.